Boise Police officers are taking over Health class at Boise School District middle and high schools, teaching teens about the dangers of addiction. 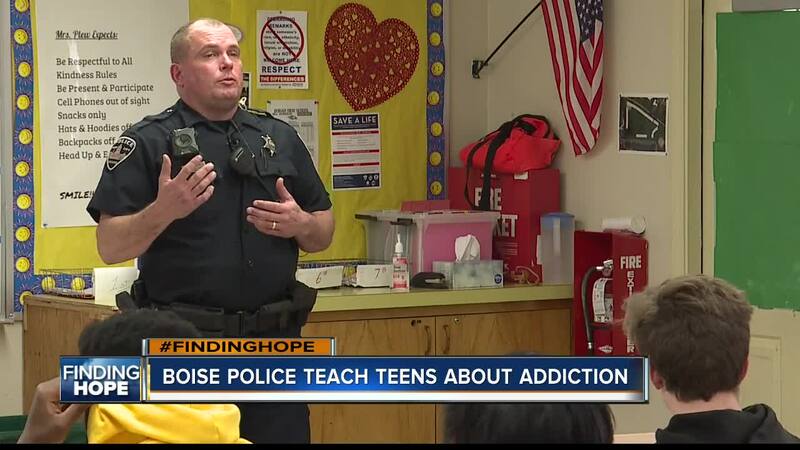 BOISE, Idaho — Boise Police officers are taking over Health class at Boise School District middle and high schools, teaching teens about the dangers of addiction. Student Resource Officer Jim Cromwell says 90% of addicts start using drugs or alcohol in their teen years, a fact that is encouraging officers to educate eighth and eleventh graders before it's too late. "I want to give you guys as much information as I can, so when you make that decision, you're going to make it with the best knowledge that you've got," Officer Cromwell told juniors at Borah High School. To capture the attention of a classroom full of 16-year-olds, officers structure the curriculum as a Jeopordy-style, interactive game with categories ranging from "Types of Drugs" and "Facts and Stats" to "Consequences" and "What Drug Am I?" For some students, the biggest takeaway was the consequences attached to certain drug charges and the possible jail time offenders can face, even as a teen. "[Now I'm] aware of the harm of these drugs and what can happen to you in the future if you do these things," junior Caden Boutdy said. "Some of them are going to learn from the consequences as far as legal system and other ones are going to learn from what happens to them in life," Cromwell said. "So I want them to take away the worst case scenario, even though it's not the most common--we want them to know that worst case scenario and what could happen, because it does happen to people."